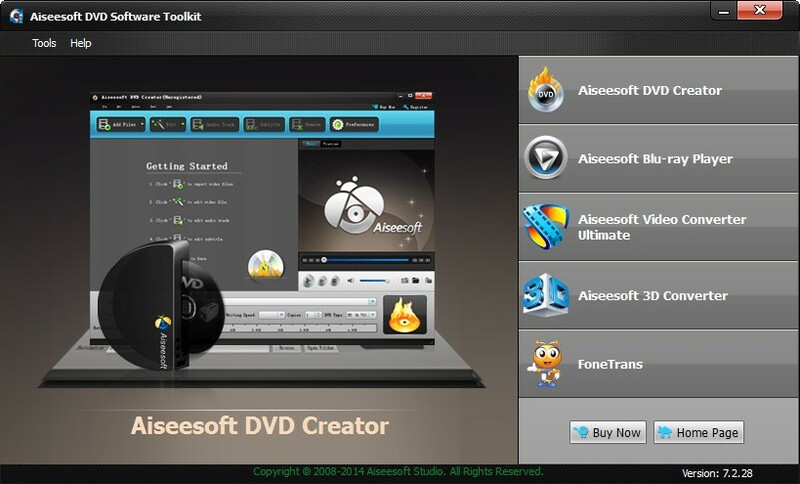 Aiseesoft DVD Software Toolkit offers users five wonderful DVD/video softwares: Aiseesoft DVD Creator, Aiseesoft Blu-ray Player, Aiseesoft Video Converter Ultimate, Aiseesoft FoneTrans and Aiseesoft 3D Converter. Aiseesoft DVD Software Toolkit consists of DVD Creator, Blu-ray Player, Video Converter Ultimate, FoneTrans and 3D Converter. With it, you can rip any homemade DVD and convert popular video/audio files to any video and audio format, transfer video, audio and photo files between iPhone and PC, play blu-ray movies, convert video from 2D to 3D and burn DVD disc. What's more, it highly compatible with iPhone 6s/6s Plus, iPad mini 3/2, iPad Air 2, iPod Touch 5, iPod Nano 7, Microsoft Surface and Samsung Galaxy Note Profile. This DVD Software Toolkit can help users convert any homemade DVD/video to all popular video and audio formats, including AMV, ASF, MKV, AVI, DivX, Flash H264, H.264 AVI, H.264/MPEG-4, AVC, M4V MPEG-4, FLV, SWF, MOV, MTV, MPEG-1, MPEG-2, MPEG-4, VOB, XviD, WMV, VCD, DVD,WebM, DV, HD video and AU, AAC, AC3, AIFF, AMR, FLAC, M4A, MP2, MP3, OGG, WMA, WAV audio. The included DVD Creator software enables users to create any DVD with popular videos. Also it provides you with powerful video editing functions, such as trimming, cropping, merging, wartermarking, and adjust the output video brightness, contrast, saturation, hue, and volume. For better quality, this software allows users to define the output video or audio parameters, such as Video Resolution, Video Bitrate, Frame Rate, Encoder and Audio Channels, Sample Rate, Encoder, Audio Bitrate. With the Aiseesoft Blu-ray Player, users can enjoy his favourite nlu-ray movies in full HD 1080p on his PC. Users can play BD discs/folders/iSO files with this software. Aiseesoft FoneTrans allows users to transfer many files between computer and iOS device or between any two iOS devices. To backup files on your iOS device to iTunes or computer is also available for you. 2016-11-14 7.3.2 FoneTrans support the new iOS 9 and iTunes 12.3.